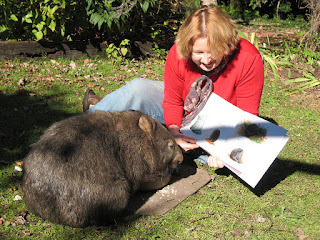 Jackie French is an author, historian, honorary wombat, 2014-2015 Australian Children’s Laureate, 2015 Senior Australian of the Year, and passionate believer in the power of story. She is also an historian, ecologist, dyslexic, and a passionate worker for literacy, and the right of all children to be able to read. This is the story of the one day in the year when we remember. Perhaps every person who celebrates Anzac Day remembers different things, in different ways; the loss of comrades serving their countries, grandfathers and great aunts, the journeys of refugees fleeing horror in their homeland. 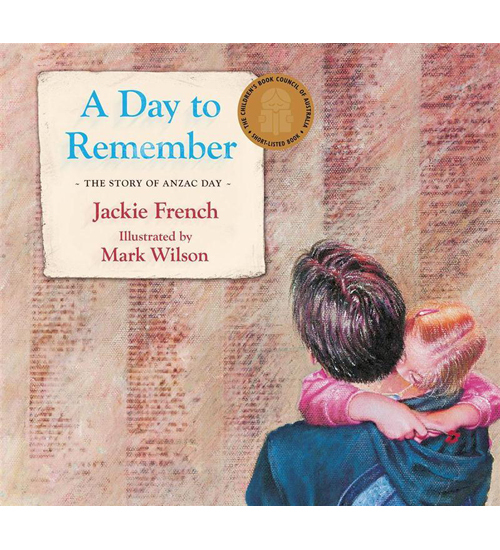 A Day to Remember is the history of that day, and how it has changed. It is also the history of how Australia and its people have changed, too. Name a positive outcome while you were writing/illustrating the book before or after. Name something sad/tragic you discovered. When I was three years old I glimpsed my best friend’s father and screamed. He was bent, his arms dangled strangely, his white skin was marked by long red scars. I thought he was a giant spider. My mother quickly took me home. She explained that he had been tortured in a Japanese prison camp; that he had suffered so that kids like me could be safe. Even at three I knew that there was no way to apologise for instinctively screaming when you saw him, except, perhaps, by showing gratitude your whole life. Name something interesting you discovered. While I was writing, we hunted out photos of him. The only one of him in uniform is in a sergeant’s uniform, taken in 1917, but he was never a sergeant. Where was it taken and why? In a play? While he was in hospital in France? But other photos - and there are not very many - show him with the young woman he would marry. She died of leukemia when my husband was young. But those photos are of a deeply happy man, looking adoringly at the beautiful woman that he loved. For the first time, my husband realized that despite the war, the deaths of so many of his friends and his wife, parts of his father’s life were happy, and deeply fulfilled. Bryan’s father had never told Bryan that he was proud of him. Blokes didn’t back then. It took fifty years for Bryan to discover what his father had been through in that war; and to also find out that his father had been proud. Can you please tell us how you illustrated the book? I started all the paintings in grey-lead pencil or charcoal pencil on paper, usually Kent Cartridge or something else a bit heavy, and left some of those as they were throughout the book. I simply glued them down onto canvas on some pages. What can I say – I love pencil! The cover is acrylic paint on primed canvas, featuring my son and grand-daughter at the Wall of Remembrance, Australian War Memorial, Canberra. The painting on page 22-23 of the beach at Gallipoli is also acrylic on canvas. The title page is the original sketch I did at the Frankston Anzac day Parade in 1998. Page 11 is also pencil on paper. Every background wash for every colour illustration is done with a rag dripping with water and paint or coloured ink and just rubbed onto the canvas or paper. Great effects! All the other illustrations are done with mixed media. I mostly start with a pencil drawing, adding a background wash in the theme colour I have chosen for each page. This is blue for pages 4-5 and 20-21, yellow ochre for pages 6-7 and 24-25 and army green for the Vietnam pages and pages 26-27. When the whole book is blocked in like that, I add acrylic or Derwent pencil for detail and texture (I just like working in pencil for some reason). I also use ‘Bart Simpson’ crayons too – anything lying around! I then add more pelican ink washes to build up the colour where needed, or coloured biro work where I need more detail or contrast (you can buy sets of these at any newsagent now days). Some of the small canvas paintings or pencil drawings throughout the book are done as studies, but if they work out, I paste them onto the final art. There is no Photoshop work. It is all drawing, paint and paste (a lot of glue goes into each book!). What did you need to research for your pictures? I have used over one hundred images in the illustrations. Many are from the Australian War Memorial in Canberra, Australia, but most from my own family. I never use them directly, but change the angle to add drama or a particular mood. My mother was in the RAAF in WW2 and I used photos of her on p. 31 next to my father, a pipot at the time. My father was a pilot, then a photographer in the RAAF in both WW2, Japan New Guinea and Vietnam, and I used many of his photos as reference. Many are quite personal, like the illustration of dad on the Vietnam pages. It was based on the only photo that exists of his service in Vietnam. He sent mum a letter with it in 1968, saying that he was okay, but had recurring stomach pains. We didn’t know it at the time, but it was cancer. I tell this story now, because we all have stories of the personal sacrifices that our loved ones have made. I can sit here now and write this, happy in the knowledge that my children and grandchildren are safe, and face a life of freedom and opportunity because of what they did, and are still doing today. • Almost every Australian or their families have been affected by war. Ask parents, grandparents and older friends about their experiences and stories; compare those from different countries, different ages. • Choose a humanitarian task where Australia has played a role and try to find out more about it. • How do Anzac ceremonies vary? What are the many traditions of Anzac Day? • Find out where Anzac Day is celebrated beyond Australia and learn how and why the tradition is upheld there too. • Look up the Register of War memorials in your state or territory. What are the different ways those who suffered or gave their lives in war are remembered? • How do you think war, and those who suffer in war, are best remembered?